SQL Garbage Collector: Recursive Self Join - A futile endeavor!! The above query cannot be used if the depth in the heriarchy increases or decreases. I was wondering whether I could come up with a depth-agnostic implementation with all the new features that we have in SQL Server 2005. I realised that the only T-SQL feature (to my knowledge) that can get me close to the solution was the APPLY operator. will find all the subordinates of 2 and will pass them to the function again to get their subordinates and will go on till you don't get any subordinates for an employee (termination condition) and return the result. "View or function 'dbo.GetAllSubordinates' contains a self-reference. Views or functions cannot reference themselves directly or indirectly." With a misconception that this too can be circumvented, I went ahead and tried to use OPENROWSET function and somewhere in the middle of the implementation it struck me why my approach can never work. The definition from BOL "The APPLY operator allows you to invoke a table-valued function for each row returned by an outer table expression of a query." In other words, its a union of all the cross joins between each row in the outer table with the result from the table valued function for that row. It means that all the rows returned after the cross apply should follow the same schema, which, in turn, means that the schema of any function should be fixed during the design time. The schema for the table returned by the function GetAllSubordinates will vary based on the depth of the leaf level employee from the input employeeID. And, you can't UNION result sets with different schema. 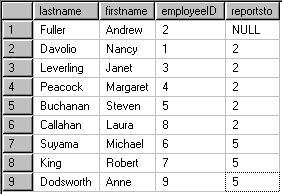 Maybe, we can make the table returned by the function GetAllSubordinates to have the same schema (which I haven't figured out how, yet) by making the rest of the columns to be null. But, then, to get that I don't have to go for a recursive function, I can do it by just using query 2. I have a feeling (though I cannot put my finger on it now) that the answer to the question "Why the PIVOT operator cannot take a select sub-query in the IN clause?" is much more complex and very much related to the issue we have now (though, at the database engine level). Or is there a simple explanation that I miss? Recursive SQL may let a table grow vertically. The main reason why a table cannot "grow" horizontally is that both a table function and a CTE must decide on its number of columns in advance. It's a conceptual aspect: tables have fixed column structure but varying row content. The only way around that I can see is to let the last column "grow" by concatenation new values to it. So in your example you could create a table with all employees (first column), each with a comma-separated list of their subordinates, by using a recursive CTE.